Saturday May 19th 1894 I was busy all forenoon with doing my baking. We went to town in the afternoon. I went over and got more plants. we went down to the field where Leonard was at work as we came back. I took came of my chickens and did the evening work. It has turned cold enough to need fire in the house. I read in the evening a little after I cane in from where Wills was burning brush. Sunday May 20th 1894 I was busy all forenoon. We did not go to church But had dinner early and went over to Woolfs where we had a pleasant visit. Stopped at Otts awhile on the way home. It looked very much like rain so I put out some plants before I got our supper. weather cool. 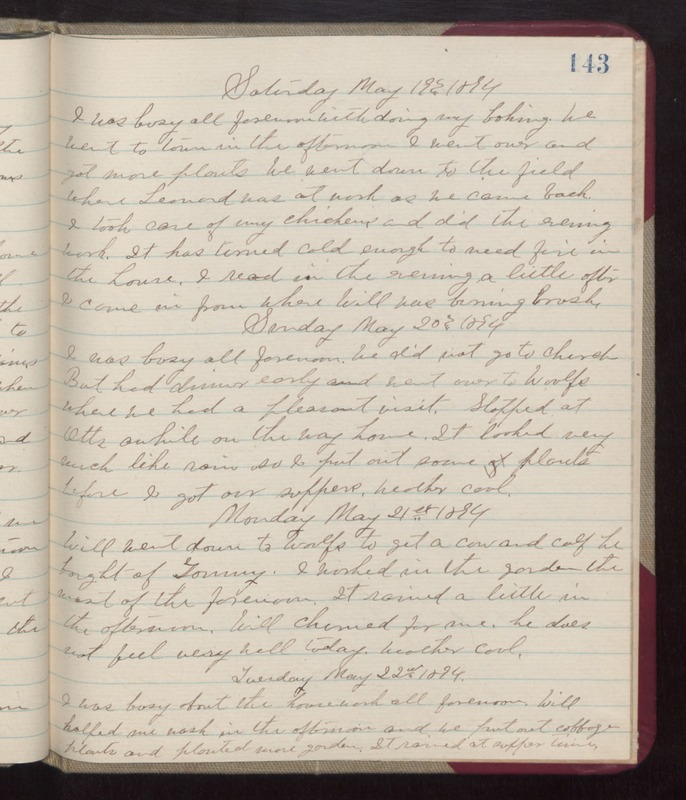 Monday May 21st 1894 Will went down to Woolfs to get a cow and calf he bought of Tommy. I worked in the garden the most of the forenoon. It rained a little in the afternoon. Will churned for me. he does not feel very well today. weather cool. Tuesday May 22nd 1894 I was busy about the housework all forenoon. Will helped me wash in the afternoon and we put out cabbage plants and planted more garden. It rained at supper time.